Here's a visita iglesia closer to home. After our trip around Sta. Ana, I decided to visit various churches in Makati City. There are two heritage churches plus an old chapel which I heard was no longer used as a chapel. But many of the churches in Makati are very noteworthy. One of them is even designed by a National Artist. 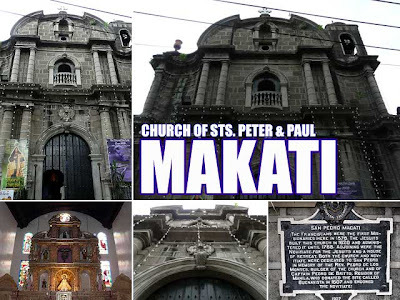 The main town church of Makati is the Church of Sts. Peter and Paul (Poblacion). The original retablo is there but we were shocked to see new embellishments which overpowered the simple charm of the church. some of these interior designers have this wrong notion that more gold and burloloy is wonderful. They should be given a lesson in Heritage Conservation 101. Nearby is the Nuestra Senora de Gracia Church (Guadalupe Viejo). This was bombed during WWII and what is left of it is the facade. This used to be a huge church complex. 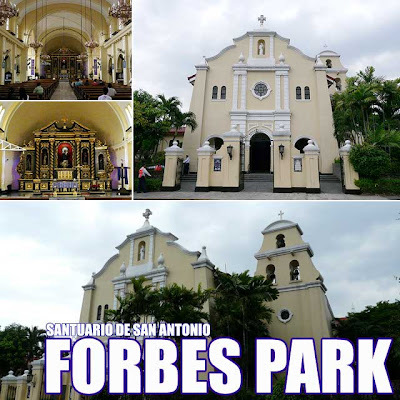 The Sanctuario de San Antonio (Forbes Park) was built by the Franciscans after their mother church in Intramuros was destroyed during WWII. Except for the Augustinians, most religious orders moved out and established their headquarters elsewhere. In the main altar is a war survivor, a statue of St. Anthony from the original San Francisco Church in Intramuros. In Greenbelt is the Chapel of Sto. Nino de Paz, commonly called the Greenbelt Chapel. It floats in the middle of a pond, and is surrounded by green. Robinsons should have done that to the Jesuit Church in Padre Faura. 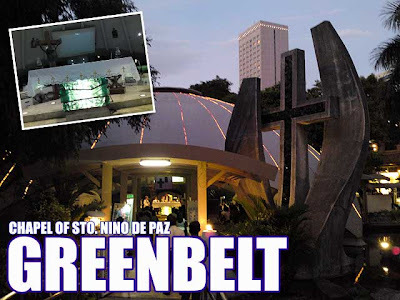 The Greenbelt Chapel was designed by Architect Willie Fernandez and later enhanced by Jess Dizon who rendered the circular pattern of the building. You will also notice works of renowned glass sculptor Ramon Orlina, who fabricated the ceiling, tabernacle, altar, the large cross at the entrance, the sacristy, and the God the Father image on the dome. 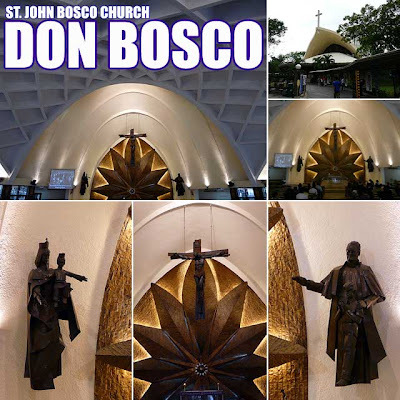 The St. John Bosco Church or the Don Bosco Church (San Lorenzo) is another work of art designed by Architect Jose Maria Zaragoza. The statues that adorn the church were done by sculptor Eduardo Castrillo. 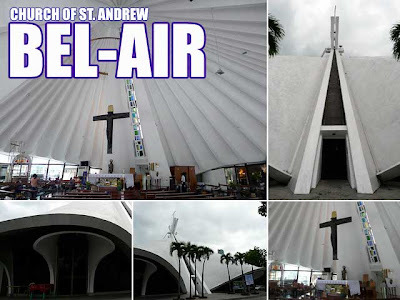 Saint Andrew Church (Bel-Air) is a work of National Artist for Architecture Leandro Locsin. But I felt, for some reason, that the exterior of the church was a bit neglected. Other chapels and churches you can visit are the Guadalupe Chapel in the BDO Building, a building also designed by Leandro Locsin. I'm not sure though if it will be open on Holy Thursday. 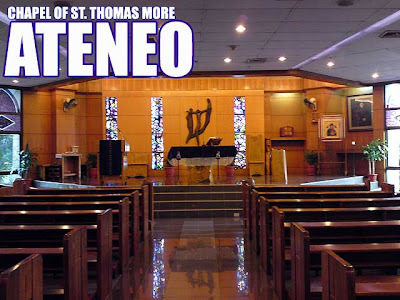 Then there's the St. Thomas More Chapel (Rockwell) at the Ateneo Professional Schools. I know Assumption College (San Lorenzo) also has a nice chapel. 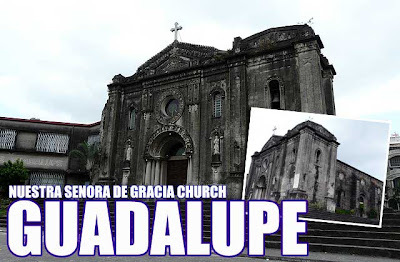 Another school chapel would be the one in Colegio de San Agustin (Dasmarinas). 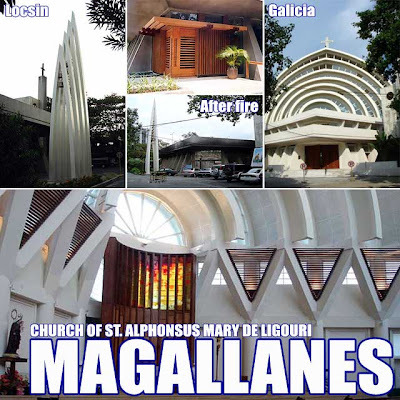 Finally, another Locsin masterpiece that will surely be missed is the Church of St. Alphonsus Mary Ligouri (Magallanes) which burned down some years back. A new, but equally impressive church was built, designed by heritage architect Dominic Galicia. This is a great churches for visita iglesia this coming holy week. 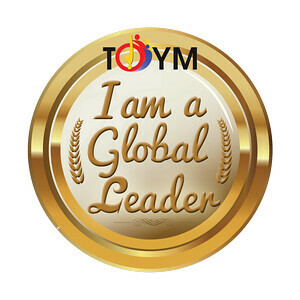 Thanks for sharing this great churches of metro manila. This is our 3rd year of practicing Visita Iglesia. We usually choose a particular area so I guess the Makati area would be our choice for this year. In our 1st year, we went to Manila, then Paranaque Area. We take pictures of the Churches that we've been to with a small/brief note about the Church.